We are a generation of multitaskers. We want to be engaging with as many experiences as we possibly can every moment. We can’t even sit on the toilet for a few minutes without checking our Twitter or firing up Clash of Clans. More and more treadmills and ellipticals are designed with a shelf or a rack of a tablet, so someone can watch TV or read a book while working out (this is of course assuming the workout machine doesn’t already have a TV built into it, which is more and more the case). Maybe you yourself aren’t so devoted to multitasking. But odds are you always like to have some music going. If you’re just cleaning the apartment, or washing dishes, or on your commute, that’s part of your daily drudge. But having some music going allows you to be somewhat entertained while seeing to these unavoidable tasks, and consequently makes them a lot less burdensome. Whether you’re running on the treadmill or getting in the zone to do some studying, I’ll outline the very best app options to download free music or stream music. I’ll primarily focus on apps that are available for iPhone or Android but you can also get many of these services on your Mac or PC depending on what type of service you prefer. Know that, while several developers publish for iOS and Android, significantly fewer are cranking things out for Windows Mobile, so the landscape of available apps often looks completely different. If you’re a WP user and you would like to weigh in on the availability (and quality) of these apps for your device, feel free to post a comment, and we may incorporate it in a future edit of this article. Many of the options below have pros and cons so it’s good to get an idea of what you want in a free music service and decide from there. Remember, that although many of the apps have free options, a lot of them have paid for versions where you can eliminate ads and have more flexibility and features when it comes to streaming or downloading songs onto your device. After thinking long and hard about it, I’ve decided that their inclusion of a free version of each app still merited inclusion in this article. Although there are a lot of music apps, one of the bad things about the current App Store economy is that there is seldom a way to try things out before you buy them, so even an app with a paid upgrade is still a vast improvement on sinking five to ten bucks on an unknown quantity. There’s a saying that nothing in life is free, and that applies to the and the music industry as well. Despite many of the options below not requiring any form of payment, you are ultimately paying for the service in one way or another. Often times, there is a trade off between paying for a service or listening/viewing ads for a service. When you elect to not pay for music, the publisher has to make money on that song somehow because they are required to pay royalties to play the song. And as long as that money is making its way back to the artist, this is as it should be. The more money that is getting to the artists, the likelier it will be that we’ll get a generation of artists who feel safe to take risks and turn out something new and inventive. Otherwise, labels will only invest in the risk-free artists who are either completely fabricated (not that I don’t love the Monkees) or at least sound exactly like everything that’s already out there. Take a look at what happened to the film industry: once people started spending less on going to movies, the big brainless blockbusters didn’t go away, we just got less of the really inventive stuff. So the artists need to get their money somehow. Free services such as Spotify, Pandora, Last.fm, etc. all can provide free services because they are making money through selling ads, playlists, suggesting an artists music, or hosting events/concerts to offset their operating cost. The upside is that if you don’t mind listening to an ad every once in a while, you will get a tremendous amount of music at your fingertips without paying a dime. Pretty great if you ask me. DISCLAIMER: The options to download music illegally hurt the artist, the industry, are illegal and immoral. No one is forcing you to listen to music and the fact that you choose to do so is a measure of appreciation for the artist’s hard work and talent. There is no room for people who try to steal from those that put forth hard work and talent and provide something new and entertaining. Some people just can’t live without having music on all the time. Whether they’re working out, studying at home, driving around town, or enjoying a nice relaxing day outside, it’s essential to have that perfect playlist. The app list here spans a wide array of options for free music that you can either stream or download. Whether it’s copyleft music that is under creative commons or streaming services that require you to listen to ads every once in a while, it’s up to you to decide what you prefer. Music Download Paradise is a great option if you want to listen to copyleft (non-copyrighted) music. One of the best things about this app is that it’s super easy to use and very simple. A lot of the flash that you’ll see in other apps is cut out in this app bringing you just the music. You have a few options to create your own playlist and have your own profile so you don’t need to recreate a playlist every time you want to listen to some music. You can also save music offline which is helpful if you’re about to board an airplane or you won’t have good signal and want to still listen to tunes. This app is completely free since it serves non copyrighted music. However, you will notice that there are ads in the app. 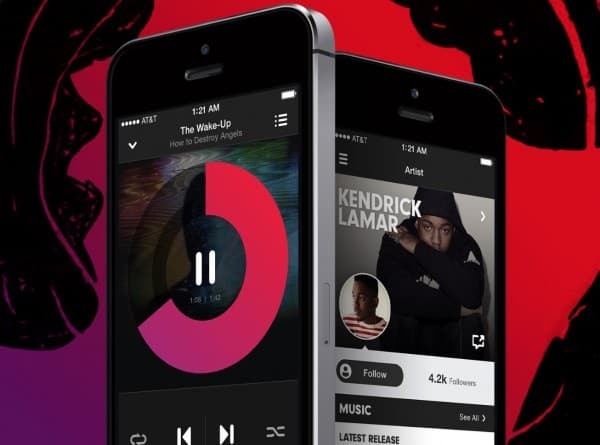 Beats Music is a new and awesome music app service. Apple recently bought Beats so it’s a subsidiary of Apple and therefore has a ton of money to make sure you get all the features you want. You will notice there is a free and a premium version of Beats. Here are just some of the awesome features that you will enjoy when listening to Beats. Apple has provided unlimited play on Beats so you don’t have to worry about hitting up against a monthly quota if you’re a heavy listener. You can choose from over 20 million songs to play anytime you want. You will notice that unlike some of the competitors, the free Beats version is completely ad free. You can listen to music offline by downloading the songs onto your iPhone or Android to listen to late. The big downfall is that you can only listen to music for 14 days with the free trial. After that, you’ll have to pay $9.99 per month in order to continue to listen. Therefore, it’s not completely free forever, but you may just get hooked after enjoying the ease of Beats. As a quick disclaimer, I personally use Spotify and have the premium paid for version. My wife is in graduate school so we get the student discount at only $5 per month. At the cost of a latte at Starbucks, we both have all the music we will every want at our fingertips. Not only that, but we have the option to free up tons of extra space on our phones and computer by consolidating our music mp3 files. You likely have heard of Spotify and know to some degree what it’s about. The awesome thing about the service is that you will notice there is a huge collection of music. I’ve never had a song/artist that I wanted to listen to that wasn’t on Spotify. With the free Spotify version you can listen to music on your mobile device, tablet, or computer which means it’s easy to switch between devices. Another great feature is that unlike Pandora, you can play the exact song that you want. Whereas Pandora won’t play an actual song that you choose, it will just build a playlist around that song but not play what you really want to hear. The next app on the list is creatively named Download Free MP3 Music. Despite the annoying name of the app, it actually is a great service that I’ve used several times. Again, this app allows you to download copyleft music that is free for anyone to download. You can search for music and download the mp3 files directly onto your Android. You can organize all of your mp3 files and as many as you’d like without having to worry about requests that you pay for the full version. The popular 4Shared Music is a streaming and downloading option to the popular storage service. Basically, you can store files on the 4Shared platform, which gives you a total of 15GB of storage for free. All you have to do is download the app and use the search functionality to look for music that you want to listen to. You can make playlists and add favorite tracks to the app. You can both download music from the 4Shared servers or upload your current music to the backup storage if you want to keep it safe and create a bit more room on your device. You can opt for the paid for version if you want to get rid of the ads. They don’t bother me but it might be annoying to some people that just want to listen to music without being “sold” something. If you have an Android device you certainly have heard about Google Play Music and likely have given it a test try. One of the greatest features is that it’s backed by and created by Google. That means you can ensure that the servers will always be up and running, the app won’t crash, you’ll get superior quality songs, and a lot of support. You have a bunch of functionality and features in this app that will make you likely to stick around. Listen to unlimited songs without any monthly limits. You can listen to your own created playlists, radio stations, handcrafted playlists from Google music experts. You don’t have to worry about storage on your Android device since the music is all stored online. However, if you want to, you can download the music onto your Android to be played offline. You can add up to 50,000 of your favorite songs from your personal music that you may have collected over time. Lastly, you can enjoy all of this music listening without having to sit through annoying ads. Blinkbox Music is an awesome service that allows you to download music from the 12 million songs to choose from. You can listen to music offline or stream free radio stations depending on your preference. This is one of the easiest methods for downloading free music onto an iPhone. I would suggest trying this out to see if it has all the music you wan to listen to. You can even listen to the top 40 songs on Blinkbox offline. Unlike a lot of other music services, Blinkbox has lyrics to popular songs so you can sing along and understand what someone is saying. As with most services, you have the option to upgrade to the premium service if you want to continue to listen to music but ad free. That wraps up this guide and hopefully gave you good sense of the various options you have to download free music from apps. If you found this article helpful, please share it and comment below if you have another app that you like to use to listen to music.